Daniel Schaffer, CEO of FEE - Highlighted the work of FEE including Eco-Schools and YRE. In the afternoon, a number of interactive workshops took place including sessions from the Marine Conservation Society, Zero Waste Cardiff, Skye Academy and Matthew Swaine (Course Director of International Journalism at Cardiff University and YRE Jury Member) on 'How to Write and Communicate Your Environmental Story’. Despite a 6:30am start, we were all really excited to be travelling to the ‘Big Eco-Schools Day’ at the Volvo Ocean Race in Cardiff on 6th June. This was part of our prize for winning first place in the National Young Reporters for the Environment Litter Less Campaign run by Keep Wales Tidy. As a Group, we met a few times before the day to talk about the kind of questions we might want to ask some of people speaking there such as the CEO of Foundation for Environmental Education Daniel Schaffer, and heavy metal marine biologist ‘Blowfish’. We arrived at the day with our press passes, notebooks and pens, feeling like proper environmental reporters! Going up on stage as a team to receive our national award was very rewarding, but we had an even bigger surprise to find out that we had won the International competition too. That was amazing, and so good to know someone was listening to what we were saying about the plight of the gannets on Grassholm. While we were at the event, we had the opportunity to interview several influential people including Daniel Schaeffer, CEO of the FEE. We asked him how he thought people can best be educated about marine litter, and how we can get older people to care. He said it was very complex, that people have to make a sacrifice, and we need tools and space to sort the problem out. 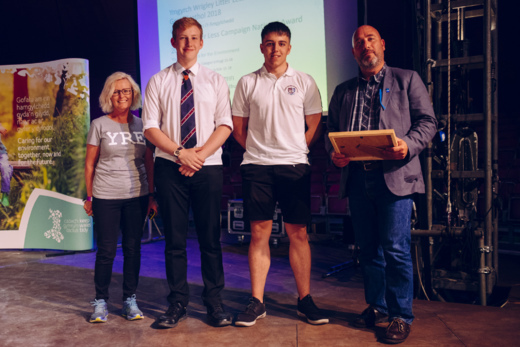 He felt that young people coming to events like the one we were at and getting involved in YRE is important, but that television programmes such as Blue Planet and the news, can be good sources of raising awareness of the issue for adults. He also acknowledged that consuming fish which have eaten plastic and therefore entering the human food chain is a huge problem. “Educating people about marine litter is very complex, they have to make a sacrifice, and we need tools and space to sort the problem out.” Daniel Schaffer, CEO of FEE. We also met and interviewed Welsh Assembly Minister for the Environment Hannah Blythyn. We asked whether she thought the Fishing for Litter scheme could be introduced in Wales. She hadn’t heard of it but said it sounded like a good idea and she may suggest it in the next Assembly meeting. That was great to hear! We asked her what she thought the government could do to introduce alternative materials other than plastic into the fishing industry. She said she recognises how difficult it might be for fishermen to replace their equipment with something other than plastic but that the Assembly government may be able to look in to alternative materials. We really hope this happens because it could make such a difference to marine life, and especially our gannets on Grassholm. At the end of the activities and interviews, we had a tour of the village. It was amazing to see all the racing boats and learn a bit about them by going inside a model that had been cut open. It was great to see the Turn the Tide on Plastic boat come sailing in to Cardiff and to think how far they’ve travelled. There was a huge model whale made out of plastic which was encouraging people to #PassOnPlastic - we felt really inspired to see that we can make a difference in our everyday lives by using materials other than plastic, and by making sure that things don’t end up in the ocean. Overall, we had a brilliant day. It was informative, educational and inspiring. To have our hard work and effort rewarded by winning the International competition left us feeling on top of the world! We have lots of ideas for taking forward the practical ways to make a difference to reducing marine litter in our oceans, and can’t wait to tell everyone about that.